This weekend Birmingham-based Desert Island Supply Company is celebrating the Grand opening of their Woodlawn writing and tutoring center. Festivities kick off at 9 a.m. on Saturday, November 17th at their new center located at 5500 First Avenue North in the Woodlawn neighborhood. They have even organized a Hobbit-Read-a-Thon, where you can be a part of a crew of readers scheduled to read through the whole Hobbit book aloud. 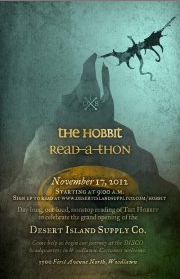 The Hobbit-Read-a-Thon is part “celebrate reading” and part fundraiser for D.I.S.C.O. which is a creative writing program that offers free writing workshops and tutoring for kids in the Birmingham area. So everything collected goes right back into helping local kids realize the importance and joy of developing a life or reading and writing (which is pretty cool). Other events are planned as well, such as live music and storytelling, balloon mapping, a writing booth, and other crafts and games. So mark your calendars, sign up to read and check it out this weekend.